Runner-ups: THE LIVES OF A BENGAL LANCER, DAVID COPPERFIELD, MAD LOVE, THE WHOLE TOWN'S TALKING, and "G" MEN. A lot of literary adaptations this year, with a lot of costumes. TopBilled, slow down! I'm trying to keep it to a year a day, so it doesn't get too congested. I appreciate your enthusiasm, but I'm just up to 1935 today. Okay..LOL..earlier in the thread, I felt like I was behind. So I was trying to catch up. Now I'm ahead of the rest. Top, you've only got a few I don't know for these two years...CRAIG'S WIFE, THE PRESIDENT'S MYSTERY and HISTORY IS MADE AT NIGHT, ELEPHANT BOY, EVER SINCE EVE. To be honest, EVER SINCE EVE (and SARATOGA which I also mentioned) are not great films per se, but they were the last ones of their respective stars-- Davies and Harlow-- and as such, I felt they deserved a tiny shout-out. THE PRESIDENT'S MYSTERY, believe it or not, is a Republic entry that was based on a short story suggested by President Roosevelt. It's actually very well made and is worth checking out. ELEPHANT BOY brought Sabu to the screen. CRAIG'S WIFE, which I have only seen aired once on TCM in the last five or six years, stars Rosalind Russell as a shrewish suburban wife. It was remade with Joan Crawford in the 50s and slightly retitled as HARRIET CRAIG. Both versions are great and would make a fine double-feature on TCM one evening. Hint-hint, programming department. For once, I have seen all of the same films that you have listed, Lawrence. I originally had THE INFORMER as an honorable mention, and it is quite good. I don't like A NIGHT AT THE OPERA as much as most people do, and I have never been able to pinpoint why. CHINA SEAS is one I used to think more highly of, but when I re-examined the film a year ago, I felt like all the leads were relying too much on stock characterizations and the script was too formulaic. Beery seems to overact more than usual, and the script almost requires him to do so, and that is why I do not entirely fault him. CAPTAIN BLOOD is enjoyable but a little too unpolished in spots. I think if it had been made a few years later when the leads were more mature, and in Technicolor, it would be more of a masterpiece. I seem to have neglected the horror output for '35-- and I definitely like Lorre's central performance in MAD LOVE. I feel BRIDE OF FRANKENSTEIN is overrated, though I like it. As for THE WHOLE TOWN'S TALKING, the two leads are excellent, but I feel like the technology is not quite there yet to make the scenes believable where Robinson is talking to himself as the other character. It is obvious we have the same actor with a split screen, and it takes me out of the movie. A lot here I don't know...HANDS ACROSS THE TABLE, TONI, GOIN TO TOWN, LA KERMESSE HEROIQUE, MAN ON THE FLYING TRAPEZE...I also haven't seen that version of ANNA KARENINA. So many titles to look for. The '35 version of ANNA KARENINA is in the TCM library so you can expect to see it sometime in the months ahead. Personally, the British version with Vivien Leigh from '48 is much better in my opinion. But see both of them, when you can. GOIN' TO TOWN is classic Mae (as in West)...and MAN ON THE FLYING TRAPEZE is one of W.C. Fields' best during his tenure at Paramount. CHINA SEAS is actually the most recently viewed movie by me on this list. I know it's little more than a mostly-polished programmer, and Gable, Harlow and Beery are all playing their respective types. But I liked it. Sometimes the most routine films hit you just right way, and this was one for me. I think that is how it was for me in the beginning, when I had first seen it. But when I stack it up against TREASURE ISLAND and the countless other films where Beery is asked (expected) to ham it up, it just seems over-baked to me. And I love all three main stars but the MGM formula is no longer fresh at this point, and they are not pushing the performers to really stretch themselves with this kind of material. Ah, Wilderness! -- A joyous movie, based on Eugene O'Neill's only comedy. Bride of Frankenstein -- Brilliant, a work of art. David Copperfield -- Great Dickens adaptation! That Obscure Object of Desire, based on the same story. The Mystery of Edwin Drood -- Stuart Walker made two great films in 1935, with some of the same actors. A Midsummer Night’s Dream -- Shakespeare meets Max Reinhardt. Gorgeous. Mutiny on the Bounty -- Another brilliant 1935 adaptation of a novel. Peter Ibbetson -- A masterpiece of surrealism. A Tale of Two Cities -- Perhaps my favorite Hollywood Dickens. "Citizens -- Vote!," "I'm an Englishwoman, I'm your match!" Werewolf of London -- My favorite of all the werewolf movies, another 1935 masterpiece by Stuart Walker. Mrs. Whack: "Is your tripe tough, Mrs. Moncaster?" Mrs. M: "Not at all." Mrs M: "It ain't tripe you're eating, it's your veil." I haven't seen Bunuel's version. But yeah, the Dietrich one is a keeper. Also glad you gave a shout-out to WEREWOLF OF LONDON-- highly atmospheric, superb cast. How can I have forgotten The 39 Steps, one of the all-time greats? I think I was working off an American list! It's one of those films TCM rarely plays, so it tends to stay out of sight, out of mind. But it's such a good one. Honorable Mentions: THEODORA GOES WILD; THE TRAIL OF THE LONESOME PINE; CRAIG'S WIFE; COME AND GET IT; MODERN TIMES; and THE PRESIDENT'S MYSTERY. 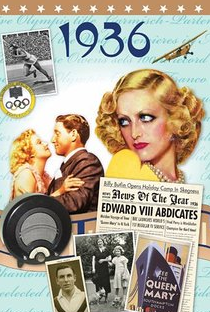 I think the best performers of 1936 were: Irene Dunne; William Powell; Luise Rainer; Walter Huston; and Greta Garbo. I think we're up to 1936 today. I was a day ahead when I posted this one yesterday. ...and a few I haven't seen but have read glowing reviews in Film Daily, Motion Picture Herald and other periodicals of the day so that they "should" be possible favorites of mine. Just sticking to US-produced films, although I could easily add some vintage George Pal and others as well. Typical "vintage" MOT, with segments: "A Soldier-King’s Son", "St. Lawrence Seaway" and "An Uncle Sam Production"
Featuring John Litel, Robert Warwick and Nedda Harrington recreating the times of Patrick Henry in Revolutionary America. Great color and great costume work. Ed a.k.a. "Mister Average Man" thinks his wife Florence Lake is cheating on him and planning murder! Actually she is reciting a play, but you can see many future TV sitcoms owing their history back here. In addition to regulars Dot Farley and Jack Rice, we also see Harry Bowen, George Lewis, Lucille Ball (yup, her!) and Bobby Burns. Interesting segment here with Professor Jacobson researching earthquakes and use of model skyscrapers. Also radiography shown in Rochester (NY) and the usual kitchen "gadgets" that soon became a cliché with this series. Evil forces take over a pharmacy (?!). These Disney knock-offs of Harman & Ising are often quite odd, but the visuals are mighty pretty. Not too many toons spoof the classical age.. and with ducks involved. Spencer Tracy, Myrna Loy, William Powell, and Sylvia Sidney appear to be my stars of the year. I know SABOTAGE is generally thought of as sub-standard Hitchcock, but I liked it, especially Sidney's performance. CESAR finished out the FANNY trilogy satisfactorily. DODSWORTH is really just a high-end soap, but I always like Walter Huston, and this is one of his better roles. THINGS TO COME is a very important film in the history of SF, and it's influence on virtually every other SF film made afterward is evident. The post-apocalyptic section prefigures everything from hit tv show "The Walking Dead" to this year's MAD MAX: FURY ROAD. Here are some from my runner up list: Libeled Lady, These Three, The Golem, Sabotage, Mr. Deeds Goes to Town, The Lower Depths, A Day In the Country, and Camille. I haven't seen Cesar as yet but do have a copy of this Fanny trilogy. As in many a year the gulf in quality between first place and the rest of the field is enormous in my view. THE GOLEM, OUR RELATIONS, THE MAN WHO COULD WORK MIRACLES, and REMBRANDT I haven't seen. I didn't know about any version of THE GOLEM except for the silent. LIBELED LADY and PETRIFIED FOREST could have been runner-ups for me. You'll love REMBRANDT. I don't know one person who hasn't enjoyed that film. It's very well-made. I am glad you mentioned FURY in your list, because I had unintentionally omitted said title. I feel ssssssoooooo awful to admit this, but I never could get "into" CAMILLE. Garbo has the best performance in it, but something about that film just... didn't... do it for me. Even after watching it twice. I feel so guilty because EVERYBODY loves it. My favorite Garbos are probably FLESH AND THE DEVIL, ANNA CHRISTIE, QUEEN CHRISTINA, NINOTCHKA... and, with guilty pleasure, MATA HARI because of the way she dominates poor Ramon Novarro into submission... to the point that your jaw can't stop dropping. The way you feel about CAMILLE is the way I feel about NINOTCHKA. I never found it very good, and then when everyone else was on the Garbo Laughs bandwagon, I gave it another try. I still didn't care much for it. In fact, I like her follow-up comedy, the much-maligned TWO-FACED WOMAN better than NINOTCHKA. But overall, Garbo is hit-or-miss for me. The Golem (1936) is by that very good French director, Julien Duvivier and has a great performance by Harry Baur. I'm tracking down a number of Baur's films. Check out his bio on the imdb. Quite a life and death which may have been at the hands of the Gestapo. He was known as the French Emil Jannings because of his 'large' performances. His Les Miserables trilogy (1934) is only recently out on Blu Ray. He would be a great choice for a SUTS spotlight. Our Relations (1936) is my favourite Laurel & Hardy film. Two sets of mis-matched twins provide lots of fun.